THE PARK AS SEEN FROM THE TRAILS. One of the favorite outings in the Rocky Mountain National Park is a trip up Fall River. An excellent automobile road across the Continental Divide had, in 1916, been completed nearly to the head of Fall River. The altitude of the mountains at the crossing point and for 3 miles beyond is nearly 11,800 feet. The course is westward near Poudre Lakes, through Milner Pass, and down the western slope to the North Fork of Grand River. On or near this route there are numerous plainly recorded evidences of ancient glaciers; many interesting evidences of volcanic activity in past ages, especially on Specimen Mountain; and unsurpassed views of the high mountains. On leaving Estes Park for the Fall River drive we pass between Castle Mountain (8,675 feet) on the right and Oldman Mountain (8,306 feet) on the left. A short stop may be made at the fish hatchery, the yearly capacity of which is 1,000,000 rainbow, eastern brook, and black-spotted native trout. Farther upstream the course lies between two commanding summits of nearly equal height, McGregor Mountain (10,482 feet) on the north and Deer Mountain (10,028 feet) to the left, south of the river. Here we meet the first clear evidence of the ancient glacier which occupied Fall River valley. The hill on which we rise nearly 500 feet within a mile is the terminal moraine. The glacial material, consisting of striated bowlders, angular stones, and rock meal, may be seen in some of the cuts where grading has been done. To the right lies the lateral moraine, a narrow ridge which increases in altitude westward to about 9,500 feet, where it joins the solid mountain rock south of Horseshoe Falls. Here the top of the ridge is nearly 1,000 feet above the floor of the valley. To the right, north of this ridge, is an eastward-draining valley about 1-1/2 miles long, which is the trough between the moraine and the unglaciated mountain slope north of it. Horseshoe Park is a basin-like opening surrounded by high mountains. In the early days this park was the home of great numbers of wild animals. These were easily secured because of the shut-in nature of the park; hence the Arapahoes called it the "In-lodge." It is the melting basin of the old Fall River Glacier. The nearly level floor of the park is the surface of the ground moraine and consists of rock fragments carried down from the mountains by the moving ice. Fall River valley was filled in this way to a maximum depth of nearly 500 feet, as measured between the bottom of the moraine at its end and its top within the park. The floor of Horseshoe Park is not entirely flat; small rounded hills or hummocks rise slightly above the general level, where for some reason now unknown the melting ice dumped more than the average load of rock débris. Some of the depressions between the hummocks are now occupied by undrained lakes. One of these, called Sheep Lake, lies close to the road. This lake has long been a favorite resort for the bighorns. These wild mountain sheep claim Bighorn Mountain (11,473 feet) for their home and come down to Sheep Lake nearly every day for water. A supply of salt placed near the lake has tempted them to frequent the spot. The old veterans no longer run wildly from the admiring tourist nor jump at the click of the camera; but when a strange sheep visits the flock and comes for the first time to the lake, amusing performances are likely to occur. He and the tourist view each other with mutual distrust. The bighorn usually considers the craggy mountain side the safest place from which to inspect suspicious strangers and springs hastily for some high point of vantage. When he finds that his companions do not share his concern, he is in a quandary whether to seek safety for himself or to wait for the others. The conspicuous ridge south of Horseshoe Park is the lateral moraine built up along the south margin of the Fall River Glacier. It is an even-crested ridge (Pl. XIX, B) which rises about 900 feet above the floor of the valley and consists chiefly of bowlders dropped at the edge of the moving ice. A tributary of Fall River, which drains the eastern end of Trail Ridge, was dammed by this moraine and deflected. From the beaver dams eastward for nearly 2 miles this stream now flows in the trough between the moraine and the unglaciated mountain south of it. Over the nearly level floor of Horseshoe Park the river winds in a serpentine course and is obstructed in many places by beaver dams (Pl. XXI), so that much of the valley floor is now swampy and covered with dense thickets of underbrush. Toward the head of the valley is an excellent view of a typical glacial gorge with the broad bottom and steep walls characteristic of a valley shaped by a mountain glacier (see fig. 6, p. 37). A stream-formed valley is likely to be somewhat crooked, to show a V-shaped profile, and to have irregular tributary gorges separated by ridges which project into the main valley. A typical glacial gorge such as Fall River valley above Horseshoe Park has a U-shaped profile with broad bottom (Pl. XXI), is relatively straight, and has few tributary gorges and few rock spurs projecting into it from the sides. The regularity of form in Fall River valley is conspicuously broken near Chasm Falls, where a salient projects into the valley from the south. The surface of this salient was rounded and polished by the ice passing over it. The upstream side, which sustained the main force of the descending ice, was worn down to a gentle slope, while on the downstream side rocks were "plucked" from the face of the cliffs, leaving a ragged precipitous slope. It is here that Chasm Falls is situated in a narrow gorge originally formed by the ice, but later modified to some extent by the stream. These smoothed surfaces may be seen in many places along the Fall River road. Where they have been protected from the weather by surface débris the polish has been preserved. Such surfaces were uncovered in many places during the construction of the road and may be recognized by the parallel scratches and grooves and by the rounded surfaces. In one place at the side of the road below the falls is a hole about 10 feet in diameter, where an eddy in the glacier ground out a circular depression in the solid rock. Above Chasm Falls the snow banks begin to appear. They are numerous and large during the early part of summer but diminish rapidly where exposed to the sun. From the trail near Ranger Station we gaze into the broad cirque which constituted the catchment basin where the snow gathered during the glacial epoch to form the main lobe of Fall River Glacier. Many large banks of snow lie on the steep sides near the rim of the cirque, where it seems incredible that they should maintain their places on the precipitous walls (see Pl. XXI). A splendid example of the gouging action of ice may be seen in the pocket occupied by Iceberg Lake, which is inclosed on three sides by almost vertical walls of rock 500 to 800 feet high. PLATE XXI. SCENES ON FALL RIVER. Upper, A beaver dam on Fall River and the brushy floor of the upper part of Horseshoe Park, where the valley is made swampy by obstruction of the natural drainage. Middle, Fall River valley as seen from Horseshoe Park, looking westward. Showing the nearly level floor and the characteristic U-shaped profile of the glacial gorge. A tributary glacial valley is shown at the right, with a mass of snow and ice at its head. Between the two valleys is Mount Chapin. Lower, A midsummer scene (July 4) in the Rocky Mountain National Park. The rim of the glacial cirque at the head of Fall River, where the Fall River road will cross the Continental Divide. From the gently sloping plain at the top the winter snow is blown by the prevailing westerly winds and finds lodgment just below the rim of the cirque. Photographs by Willis T. Lee, United States Geological Survey. The last steep climb carries us to the rim of the cirque, at an altitude of nearly 11,800 feet. Here we are on the divide between the area drained by Thompson River and that draining into the Cache la Poudre. Directly in front across the valley of the Cache la Poudre lies Specimen Mountain (12,482 feet), a relic of the ancient volcanism which disturbed this region long ages ago. The road follows the crest of the divide for about 3 miles, and the great variety of scenery obtained from it well repays every effort it costs. In little more than a mile from the point where we leave the cirque at the head of Fall River we come to the head of Forest Canyon (Pl. XXII, B) and gaze down the long trough once occupied by Thompson Glacier, almost straight for nearly 10 miles. From this place also may be seen the great series of barren summits culminating in Longs Peak. PLATE XXII. A (top). THE MEDICINE BOW OR NEVER-SUMMER RANGE AS SEEN FROM THE PROPOSED FALL RIVER ROAD. B (bottom). A SCENE FROM THE FALL RIVER ROAD AT THE CREST OF THE FRONT RANGE. Showing the head of Forest Canyon in the foreground and parts of the gently rolling surface of the high-altitude plain. SCENES FROM THE CONTINENTAL DIVIDE. To the west, across the great valley of the North Fork of Grand River, rise the numerous needle-like pinnacles of the Medicine Bow Mountains or Never-Summer Range (Pl. XXII, A), many of which are nearly 13,000 feet high. These peaks are slightly lower than those in the part of the Continental Divide within the national park, but they are no less imposing. Their varied beauty and rugged grandeur surpass description. It is useless to try to picture them except by means of the camera; and no reproduction can do them justice. Mountains like these must be seen in all their wild surroundings to be appreciated. Although Trail Ridge is accessible from the east, the climb to it from this direction is difficult. It is more easily reached from the Fall River Road to the west. For nearly 8 miles Ute Trail, so named because it was used by the Ute Indians in years gone by, follows the ridge at altitudes greater than that of timber line. Eight miles of easy trail and unrestricted view is unique even for high-altitude landscapes. From many a point on this ridge there open before us panoramas extending through the complete circle and including every mountain in the Rocky Mountain National Park and hundreds of scarcely less prominent peaks outside its boundaries. The top of this ridge is a part of the gently sloping surface called the Flattop peneplain, which occupied this region before the present mountains were carved out and before the great valleys, such as that of Fall River and Forest Canyon, were excavated. 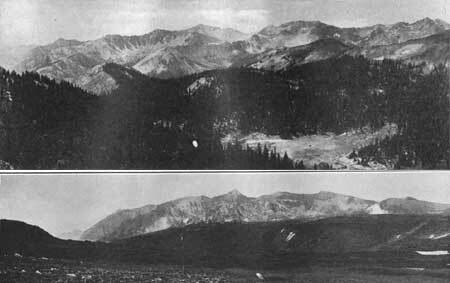 In the final shaping of the mountains the peneplain on Trail Ridge was almost destroyed in some places. For example, at Iceberg Lake there remains little more than enough of it to accommodate the trail. The ice of Fall River Glacier encroached upon it from the north and gouged out the rock walled pocket in the bottom of which lies the lake, nearly 800 feet below. The ice of Thompson Glacier encroached upon it from the south in shaping the great gorge of Forest Canyon. Some of the chief delights of a walk along the old Ute Trail are the unusual views of the peaks on the Continental Divide and the gorges which have been cut into their sides. This divide lies nearly parallel to Trail Ridge at a distance of about 4 miles. In the clear atmosphere of these altitudes objects at this distance are outlined in remarkable perfection. From the trail the view is unobstructed across Forest Canyon to such noble masses of rock as Terra Tomah Peak (12,686 feet) and the high flat-topped ridge of the Continental Divide, and into the steep-walled glacial gorges with their picturesque waterfalls and pocket lakes. Some of these, like George Lakes, appear so close together that with the connecting stream they resemble a string of jewels. Another point of special interest reached by a side trip on our way across the divide is Specimen Mountain. From the ridge at the head of Forest Canyon just described we descend a steep slope of 500 feet or more to Poudre Lakes (Pl. XXII, A), where we cross the Continental Divide. Here is another of the curious anomalies of this region, namely, a continental divide at the bottom of a valley. At the lakes we leave the main trail and follow a path which leads westward to Specimen Mountain (12,482 feet). This mountain differs notably from the other peaks of this region both in form and in the kind of rocks composing it. From the trail it appears a great rounded mass which seems out of place in this region of jagged pinnacled mountains. And in a peculiar sense it is out of place, for it differs not only in outline and composition but also in its mode of origin from all the other mountains of the Rocky Mountain National Park. Instead of the massive granite and schist which compose most of the mountains of this park, Specimen Mountain consists chiefly of rocks of eruptive origin, most of which are fragmental, arranged in thick irregular layers. The layers are steeply inclined and consist of beds of light-colored volcanic ash, flows of black obsidian or volcanic glass, and layers of conglomerate or masses of rock fragments. The blocks of rock in these beds range from grains of sand to bowlders 10 feet or more in diameter. Some of them are angular and were evidently derived by erosion from masses of igneous rock1 which had cooled and consolidated elsewhere. Others are well rounded and consist of granite and schist, such as are found in the neighboring mountains. The fragmental rock consists of several varieties of rhyolite and andesite, some of which are mineralized. Many of the green and blue shades of color are due to the presence of minerals containing iron. The fine-grained layers consist of volcanic tuff and ash, some well consolidated, others soft. Some of the fine material absorbs water until it has the consistency of soft wax or tar and is one of the causes for the formation of the gulch or so-called "crater." This sharp reentrant into the side of the mountain has walls so precipitous that some observers have imagined that it is the vent through which the igneous material of the mountain was poured out. It is not a volcanic crater in any sense, but a sharp gulch, eroded where the rocks are soft. 1. Altered andesitic rock. Contains abundant plagioclase and some altered dark mineral, probably augite, in a fine-textured groundmass made up of minute plagioclase laths and probably interstitial quartz and orthoclase. Apatite and magnetite are present, and carbonate is abundant, replacing both feldspar and dark mineral. 2. Rhyolite tuff, indurated and altered. It contains a few fragments of plagioclase, orthoclase, quartz, and biotite in a matrix originally made up of fragments of glass, largely the walls of bubbles, now altered and partly devitrified. Some undetermined secondary minerals fill some of the cavities. 3. Hornblende andesite (or latite). Contains rather abundant crystals of labradorite and brown hornblende, somewhat broken and resorbed, with a little augite in a groundmass made up of a felted mat of minute feldspar laths, probably largely orthoclase or a very sodic plagioclase. Cavities are filled with chlorite, chalcedony, and quartz. 4. Hornblende andesite. Contains abundant phenocrysts of andesine, brown hornblende, and biotite in a very finely crystalline groundmass made up largely of minute plagioclase laths. Apatite is abundant, and zircon and magnetite are present. Secondary calcite and a reddish-brown, very finely crystalline fibrous material with an index of refraction considerably below that of balsam are abundant. Because of the many unusual features connected with Specimen Mountain, we may stop a moment to consider its history. 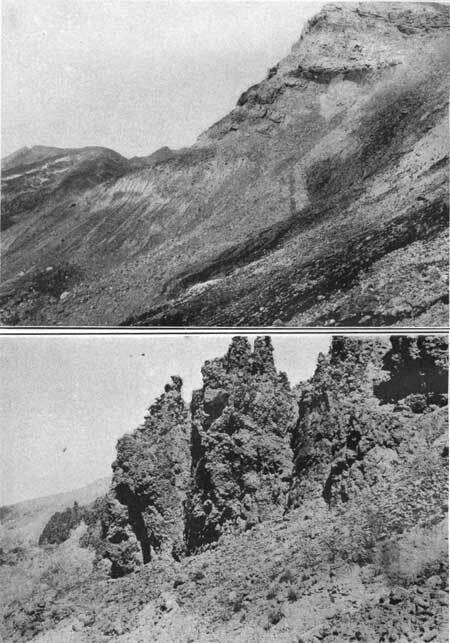 Sometime within the Tertiary period, long ages before the agents of erosion had carved out the present mountainsbefore such valleys as that of Cache la Poudre and the North Fork of Grand River had been excavatedthe material now constituting Specimen Mountain was poured out as molten rock on the surface near where this mountain now stands. It is possible that the location of the old volcanoes may be determined by further search, but it is not now known whether they were near the present mountain or at a considerable distance from it. It is probable that all surface indications of them were obliterated ages ago. The ancient volcanoes were in eruption intermittently for a long timeprobably for hundreds of thousands of years. Some of the early flows of lava cooled and hardened into rock through which solutions of mineral matter found their way. Crystalline matter was deposited, some in hollowsforming the so-called geodes of Specimen Mountain1and some as a general coloring, like the green and blue stains due to iron silicate. Later these rocks were broken up in the process of erosion and transported, probably by streams, to their present position in the beds of Specimen Mountain. With these blocks of lava were embedded many rounded or waterworn bowlders of granite and schist, transported by the streams of that remote time from areas not covered by the lava. These beds of fragmental rock were in turn covered with flows of volcanic glass, which now appear as sheets of black obsidian. The mountain is made up of numerous beds or superimposed layers which differ from one another in character, thickness, and composition (Pl. XXIII). 1Some of the specimens from this mountain contain jasper and small pieces of opal. Agate, onyx, and other forms of chalcedony also are found, some of the onyx has the parallel banding desired for cameos. These beds were formed in nearly horizontal layers, but they are now steeply inclined, owing to rock movements which have occurred since they were laid down. The movements may have been in progress at the same time that the valleys were being eroded, but as the beds were formed nearly horizontal on relatively low land and are now steeply tilted and form the top of a high mountain, it follows that they were formed before the mountains attained their present altitude and before the great valleys were excavated. It follows further that although the rocks of Specimen Mountain are of igneous origin, this mountain can not correctly be called a volcano. At Poudre Lakes it is noticeable that the granite and schist contain dikes of the same kinds of rock as those found on Specimen Mountain. Some of these are light-colored; others are dark pink. They consist of the material forced from some reservoir of molten rock beneath the surface, which found its way upward through cracks in the older rock. From the trail west of this pass we obtain beautiful views of the southern end of the Medicine Bow Mountains, or Never-Summer Range. The Continental Divide, in which is crossed at Poudre Lakes, ascends Specimen Mountain, crosses the saddle of La Poudre Pass, swings westward over Mount Neota and though Lula Pass, around the head of the North Fork of Grand River. Here it turns southward and follows the crest of the Medicine Bow Mountains (Pl. XXII, A) to Cascade Mountain, where it swings west beyond the boundary of the area mapped (Pl. I). The stormy character of this range, conveyed by the Indian name translated as Never-no-summer, is indicated by the modern names of the peaks, such as Mount Cirrus (12,804 feet), Mount Cumulus (12,724 feet), and Mount Nimbus (12,730 feet). For many tourists the Fall River route ends at "Squeaky Bob's," a lodge famous as a pleasant stopping place in North Fork Valley west of Milner Pass. It is owned by Robert Wheeler, who is called Squeaky Bob because of a falsetto voice. The nickname is accepted with good humor, and many a tourist who has enjoyed the hospitality of the lodge, which the owner chooses to call "Hotel de Hardscrabble" (Pl. XIII, B, p. 46), may be surprised to learn that he has a more formal name. 1The Continental Divide does not always follow the highest ridges. Longs Peak, the highest peak in the park, is 2 miles east of this divide. In La Poudre Pass it is more than 4,000 feet lower than the top of Longs Peak. In some places the divide crosses areas so nearly level that it is not easy to determine where the line should be drawn. In both Milner and La Poudre passes lakes lie so nearly on the divide that it is not easy to determine whether they are on the Atlantic or the Pacific slope. The Continental Divide is the line along which the waters separate, those on one side finding their way naturally toward the Atlantic Ocean and those on the other side toward the Pacific. PLATE XXIII. A (top). WALL OF THE STEEP GULCH IN THE SIDE OF SPECIMEN MOUNTAIN. Erroneously called "The Crater." Showing inclined layers of obsidian (volcanic glass), tuff, breccia, volcanic ash, and conglomerate. B (bottom). DETAIL IN THE WALL OF SPECIMEN MOUNTAIN. Showing the eroded edge of a layer of breccia and conglomerate. The angular blocks are andesite and the rounded ones are bowlders of granite and schist. Several Indian traditions are perpetuated in the names of this part of the Rocky Mountain National Park. 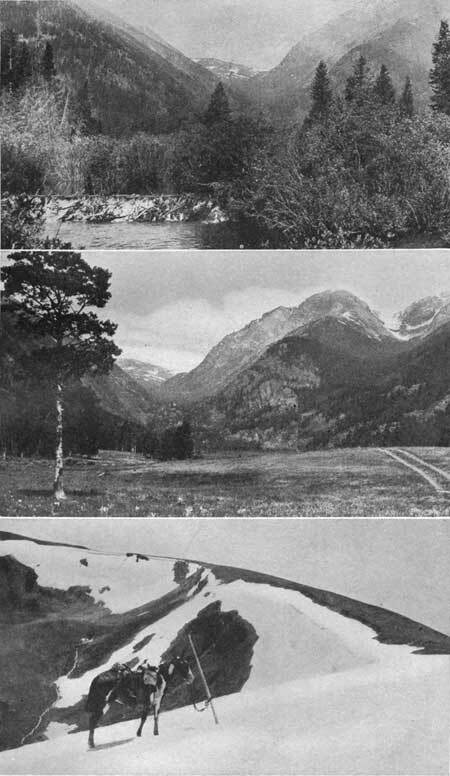 Milner Pass was called "Deer Pass" (bihhee-thoson) and the needle-like peaks to the north of Mount Richthofen, sometimes called Saw-Tooth Mountain, the Arapahoes called the "Eagle's Nest" (necihhi-nohhoo). At the head of the valley is Lula Pass, which the Arapahoes named "Thunder Pass" (bonnapah-neethason), for they said there was always a black cloud over it. South of this lies the beautifully sculptured "Never-Summer Range," near the southern end of which is Mount Baker, which the Indians called "Where the Sparrow Hawk's Young Hang" (haiya sona toyothay), because there were sparrow hawks' nests there. Also according to Mr. Toll, who is the authority for these statements, the North Fork of the Grand was called Coyote Creek (ka wu nee che), and the big open plain of the valley below Squeaky Bob's place was Called "Plenty Jerked Elk Meat" (tee wohhoó tho). Returning now to Estes Park we will next take the trip by automobile over the High Drive. This is one of the easiest excursions in the vicinity of Estes Park, although it embraces many features of unusual interest. We may go up Fall River and return by a southern route around Deer Mountain, or we may start up Thompson River and pass around this mountain in the opposite direction. On the latter route we leave Prospect Mountain (8,896 feet) on our left and mount the southern slope of Deer Mountain (Pl. VII, A, p. 28) over a naturally macadamized road made of the crystals of quartz and pink feldspar from disintegrated granite. From the top of the ridge north of Deer Mountain there are superb views of the group of mountains surrounding Hagues Peak to the north, and of the high range from Longs Peak to Flattop to the southwest. To the south, stretching out as on a map, lie (1) the broad rolling surface of an unglaciated valley; (2) the northern lateral moraine of Thompson Glacier, separating the broad valley from Moraine Park; (3) the flat-bottomed melting basin of this glacier, known as Moraine Park; (4) the great even-crested ridge or southern lateral moraine of Thompson Glacier, more than 2 miles long and rising 800 feet or more above the floor of the park. Beyond these are the great snow-flecked mountains which dominate the view and dwarf the less magnificent features of the foreground. These are best brought out by the panoramic view given as Plate VII, A, p. 28. The view toward the north is scarcely less impressive. Below lies Horseshoe Park, the level-floored melting basin of Fall River Glacier, and beyond it Ypsilon and its neighboring mountains rise in dominating magnificence (see Pl. XIX, A, p. 50). On the return trip we traverse the part of the Fall River route described on page 50.